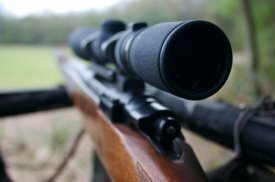 Aiming a rifle without the use of a telescopic sight, commonly called a scope, is both complex and inaccurate. The process of lining up your target with the rear sight and the front sight takes time, while considering both elevation and windage complicates things even more. This is particularly challenging for older eyes that have a difficult time focusing between objects that are near and objects that are farther away. Because of this, most gun aficionados use some kind of optical aiming device. Hunters can’t afford to lose a minute when their prey comes into view, and killing an animal with an accurately placed shot is both time effective and humane. This is where a rifle scope becomes a real asset. Lining up a target between the cross hairs of the scope increases the effectiveness of any shot. Because the scope acts as a telescope, it allows a shooter to see things more clearly from further distances. The focus is adjustable so that a shooter can compensate for their vision weaknesses and allow the eye to be on the same optic plane as the intended destination. Scopes work using the same principle as an optical refracting telescope. This means that they bend light rays through several lenses within the scope. Short scopes tend to have smaller lenses and therefore less powerful magnification, while longer scopes allow for much better amplification. Though using a scope makes hitting the bullseye of a target much easier, there are other frustrations recreational shooters still have to deal with such as glare, ambient lighting and the irritating effects of wind and dust blowing into the viewing eye. Fortunately, Eyeshields from Field Optics Research can cut down on such issues. These Eyeshields are made of pliable plastic and attach to the viewing piece of a rifle scope. The malleable shield fits seamlessly against the skin around the eye providing a more comfortable viewing experience and more accuracy in shooting. When not in use, the shield folds back out of the way. To learn more about eyeshields for rifle scopes, click here.